We seem to underestimate the difference the shape and colour of our eyebrows can have on the rest of our overall look and apart from plucking them when we see some stray hairs starting to rear their heads we tend to pay them little/no attention. Getting too tweezer happy and over plucking makes a huge difference to our face. After all eyebrows technically frame our eyes and therefore help to define them. You can play around with your eyebrows to get more natural and more dramatic looks simply by using simple tools such an an angled brush, brown eye-shadow, an eyebrow pencil and an eyebrow brush. Benefit seems to agree that eyebrows are extremely important and have upgraded their Brow Zings mini kit to the new and improved Brows a-go-go, which includes everything you could ever want to pamper your brows and achieve that professional eye look anywhere. The little kit comes with brow zings powder in light and dark, brow zings wax, smokin’ liner, eye bright, brow highlighter powder, mini tweezers, a hard angle/talent brush and a step by step lesson to help you get it right! The instructions are a great idea and for those with not much brow preening experience it is best to follow them to the letter at first. In a nutshell the steps are to wax, powder, tweeze,line, highlight then eyebright. Even if you decide you want to experiment with products from home before investing in this kit, this simple formula will help you to achieve the right look. With Christmas just around the corner and with heavy brows making a comeback on the catwalk this would undoubtedly make any make-up lover very very happy! 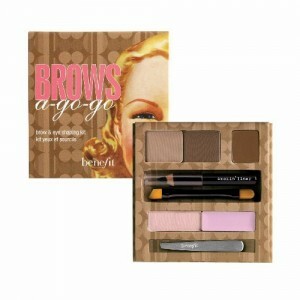 Brow’s a-go-go is priced at £26.50 and is available from the Benefit website, Boots, Asos and most good department stores.